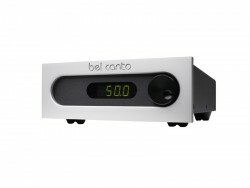 The Bel Canto Dual-Differential DAC3.5VB Control Center features a class leading 126dB dynamic range with our proprietary low noise digital to analog convertor core. Including five 24/192 digital inputs, high speed ST fiber and a 24/192 ADC analog input, the DAC3.5VB integrates and controls all of your audio sources including an analog input for a phono preamp or Home Theater Bypass. The front panel features a single multifunction control knob that selects inputs and controls volume level. The DAC3.5VB also includes our new 8 character alpha-numeric display and the ability to control balance, absolute phase and to rename and disable unused inputs. 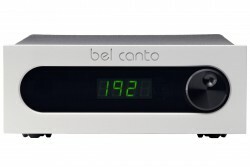 Bel Canto, nhà sản xuất thiết bị audio hi-end của Mỹ đã có những sản phẩm nổi tiếng thuộc nhiều thế hệ công nghệ khác nhau. Từ những ampli single-end chạy đèn 211/845 cách đây vài chục năm đến những sản phẩm hi-fi kỹ thuật số dòng eVo và mới nhất là thế hệ e.One… Bất kỳ dòng sản phẩm nào của Bel Canto cũng đều nổi bật bởi sự đơn giản và hiệu quả trong sử dụng. 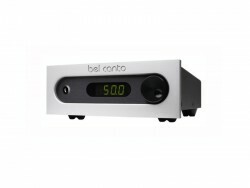 The DAC1.5 converts your digital media into music while giving you full control of your system. It provides the most direct connection from your music to your amplifier. Low jitter, low noise and power isolation delivers the startling dynamics in your music. The REFLink is designed in a solid, compact e.One chassis with display. The internal circuit boards are constructed with multiple stages of low noise isolated power supplies driving individual sections of the circuitry, while the Ultra-Low Phase Noise master clocks and line drivers are powered by a separate low noise power supply. There are two stages of galvanic isolation between the USB input and output and clocks stages. Great care was taken powering the REFLink; no power is drawn from the USB input, reducing possible interference from the USB cable and computer source power. The e.One uLink provides these features to those who connect their computers to one of the many higher-end DACs that lack USB inputs or that fail to maintain their asynchronous USB drivers over time. Of the roughly 500 motherboards listed at computer-parts retailer newegg.com, only about half have optical or coaxial outputs -- and the vast majority of these are optical only. Dedicated digital audio outputs are even less common on notebook computers. A huge number of audiophiles – tech-savvy and traditionalists – use computers as a primary music source and like all enthusiasts want the beyond-CD sound they’re capable of. 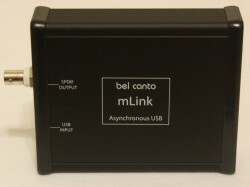 Bel Canto makes it happen with three new Asynchronous USB Link Converters; the entry-level mLink, moving-on-up uLink, and top-of-the-line REFLink. 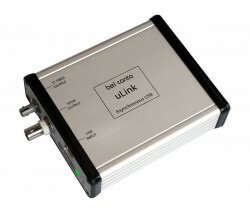 These new USB Link Converters isolate the music signal – and clocks – from the harsh, noisy electrical environments of computers and music servers.